Some 5.7 million Spaniards, equivalent to almost one in four of the workforce, are now seeking jobs, according to official figures. The country's unemployment rate rose to 24.6% between April and June, up from 24.4% during the previous quarter. That's the highest level since 1976, soon after the death of the right-wing dictator Francisco Franco, and before the country returned to democracy. Separately, Spain's third largest bank reported an 80% fall in net profits. CaixaBank said net profits fell to 166m euros ($203m; £129m) during the January to June period. CaixaBank also set aside 2.7bn euros against its property assets, in accordance with reform requirements stipulated by the government in May. On Thursday, Spain's biggest bank, Santander, reported that its profits halved during the period. 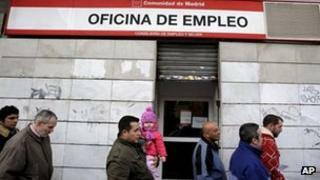 Spain's economy is in dire straits and economists see few signs of improvement any time soon. "Things are only going to get worse," said Capital Economics' Ben May. "With the economy unlikely to expand any time soon, and the dire position the economy is in, Spain is probably more likely to fall deeper into recession." Earlier in the week, Spain's borrowing costs jumped above 7% on worries that the debt problems being faced by several of the country's regional governments would push Spain towards seeking a full bailout. Bond costs above 7% are generally considered to be unsustainable in the long run. However, However, on Thursday, European Central Bank (ECB) president Mario Draghi said the bank would do "whatever it takes" to preserve the single currency. Spanish bond yields fell back to 6.85% following Mr Draghi's comments, amidst expectations that the ECB might soon intervene in the market, for instance by buying bonds. Later on Friday, French President Francois Hollande and German Chancellor Angela Merkel will discuss ways to quickly implement a plan to shore up the euro, agreed at the European Union Summit last month, a French source told Reuters. A report in the French newspaper Le Monde also said that eurozone governments and the ECB were preparing to take action to cut borrowing costs for Spain and Italy.